Heat the grill or grill pan. In a large bowl, combine the ground sirloin, Dijon mustard, Worcestershire sauce, Montreal steak seasoning and the 1/2 tablespoon dried thyme leaves. Shape into burgers. In a medium skillet, heat the olive oil over medium-high heat. Toss in the onion slices and sauté for a few minutes; lower the heat, sprinkle with salt, pepper and 1/2 teaspoon thyme. Cook on low for twenty minutes until onions are tender and caramelized. Slice up that sharp cheddar into as many slices as you want for your burgers. Cook bacon: we used heavy duty aluminum foil on the grill – placed the bacon inside and cooked it right on the grill as the burgers were being grilled. Grill burgers 5-6 minutes on each side. To assemble: Spread some mayonnaise on the hamburger buns, top with grilled burger, sliced cheese, applewood smoked bacon, caramelized onions, and whatever else you like on your burgers! On my way … Really. I kid you not – I’m lured like a honeybee to burger nectar! 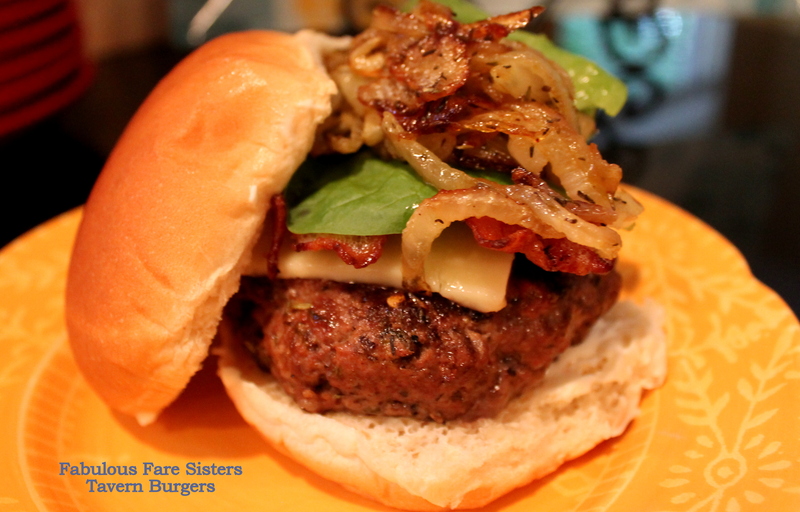 Another Burger Masterpiece by Fabulous Fare Sisters! I Simply Had to Spread the Love During Our Burger Week! Thanks Linda & Heidi! This sounds delicious! I have to ask–have you thought of writing a cookbook? I think you could get it published and have success with it. This is absolutely a creative and awesome recipe. Thanks for bringing it to the recipe challenge contest..
Now that the way to honor those onions, you’d be surprised how many restaurants or cooks have no freaking idea. I love homemade burgers. Sometime I’ll mix the cheese and bacon in the meat. These look delicious. Looks juicy. Feel like biting in. I’m for sure trying this recipe out! Those burgers and onions look divine! Thanks for sharing! It absolutely it! 🙂 Thanks!